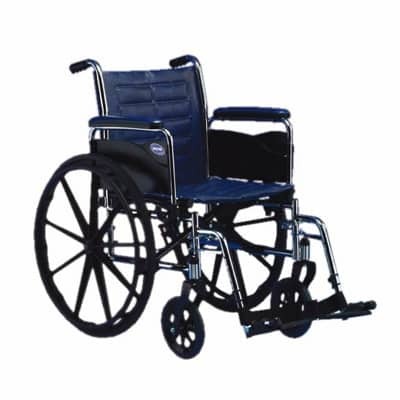 Our wide wheelchairs come with adjustable length footrests, fold to fit in your car, have brakes on both sides, weighs only 36 pounds, will support up to 250 pounds, and has an 20″ wide seat. We also carry elevated leg rests for this chair which are rented separately. All Seasons Rent All does not participate in Medicare/Medicaid or any type of insurance plans. SKU: OAA02. Categories: Medical & Guest, Medical Equipment. Tags: wheelchair, wide wheelchair. This bath tub safety grab bar will attach to almost any bathtub to add stability for those who need it getting in and out of the bathtub. All Seasons Rent All does not participate in Medicare/Medicaid or any type of insurance plans. This knee walker is great for people who have a foot or ankle injury to make getting around a lot easier and a lot quicker. The knee walker is adjustable in height to accommodate people from 4’10” thru 6’4″ and up to 300 pounds. The knee walker also comes with a carrying basket to hold all your days essentials. All Seasons Rent All does not participate in Medicare/Medicaid or any type of insurance plans. This toilet safety frame attaches to your existing toilet by simply removing your toilet seat, setting the toilet safety frame in place, and re-attaching your toilet seat. We also carry raised toilet seats which we sell separately for $25.95. All Seasons Rent All does not participate in Medicare/Medicaid or any type of insurance plans.